Afghanistan is world’s worst place to be born: U.N. Eight years after a U.S.-led invasion ousted the Taliban from power in Afghanistan, the war-ravaged state is the most dangerous place in the world for a child to be born, the United Nations said on Thursday. As Taliban insurgents increase their presence across the country, growing insecurity is also making it hard to carry out vital vaccination campaigns against polio, a crippling disease still endemic in the country, and measles that can kill children. "Afghanistan today is without a doubt the most dangerous place to be born," Daniel Toole, UNICEF regional director for South Asia, told a news briefing in Geneva. A Taliban-led insurgency and militant attack on an international guest-house in Kabul that killed five U.N. foreign staff last month prompted the world body to evacuate hundreds of international staff from Afghanistan for several weeks. Some 43 percent of the country is now virtually off-limits to aid agencies due to insecurity, according to Toole. The Taliban have been building their forces in their traditional southern and eastern Afghanistan stronghold and are increasing attacks in the north and west. Teaching girls is one of the practices they forbid. Some 317 schools in Afghanistan were attacked in the past year, killing 124 and wounding another 290, Toole said. "Afghanistan today is without a doubt the most dangerous place to be born," Daniel Toole, regional director of the UN Children’s Fund (UNICEF) for South Asia, was quoted in the media as saying on 19 November. 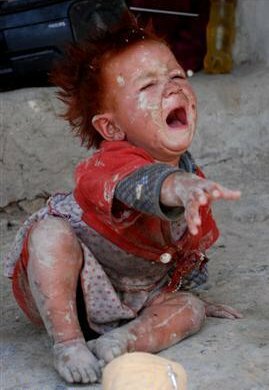 About a quarter of Afghan children die before their fifth birthday (257 per 1,000) mostly from preventable diseases such as pneumonia and diarrhoea, according to UNICEF. The country also has some of the worst child malnourishment, stunting, underweight and vitamin deficiency figures in the world. "We have seen a drop in the number of children who are attending schools and particularly young girls," he added. School enrollment in Afghanistan had risen to 5 million, including 2 million girls, against 1 million with virtually no girls in 2001 when the Taliban were ousted from power, he said. "In both countries, Afghanistan and Pakistan, we've made some progress but we're starting to worry about back-tracking on that progress given the high rates of insecurity and the ongoing conflict," Toole said. "The most dramatic indication of back-tracking is the deliberate attacks against girls' schools," he added. Separately, UNICEF director Ann Veneman spoke to reporters in New York on Thursday about the Convention on the Rights of the Child, a pact aimed at protecting children worldwide that was adopted by the U.N. General Assembly 20 years ago. Veneman said it was "frustrating" that Washington has not ratified the pact, noting that the United States and Somalia were the only two states in the world that remain outside it. The spokesman for the U.S. mission to the United Nations, Mark Kornblau, said that the administration of President Barack Obama was "committed to undertaking a thorough and thoughtful review of the Convention on the Rights of the Child."